So you can imagine how I felt last weekend when one kid was at Gran’s and the 1-year-old was asleep and I had 30 free glorious minutes to watch Barefoot Contessa. She was cooking the most delicious looking skillet chicken recipe with onions, lemons, and white wine. It looked easy enough and I immediately thought I could accomplish this recipe. I could conquer the kitchen again. Wild and crazy thought, I know, but the next thing you know I’m buying a whole chicken and lemons and onions and feeling overconfident (and obviously delirious). Then reality set in. I never found the time to take the backbone out of the chicken. I looked at that whole chicken in my refrigerator the entire week feeling defeated. I prepped for the 5-year-old’s birthday party. I made some frozen pizzas. I counted down the days until I HAD to do something with the dang chicken and I finally did! With the help from the husband, we managed to tag team the chicken prep and actually cook the recipe. 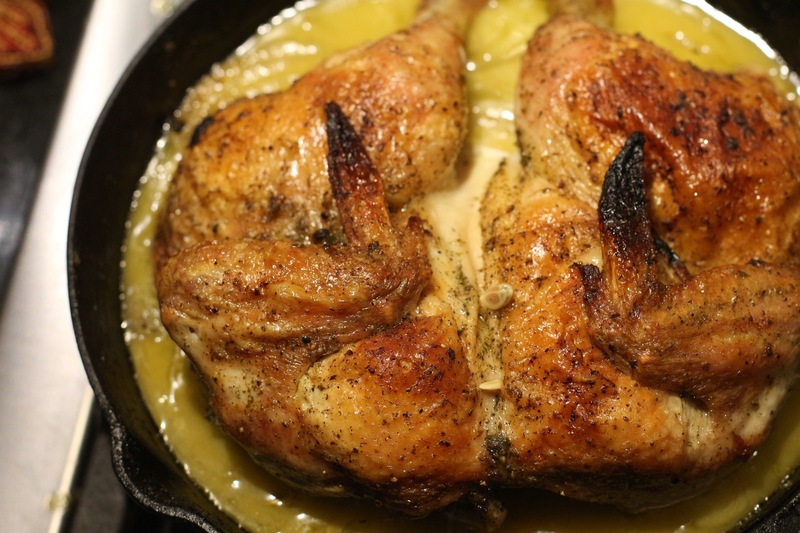 You can find the recipe here: Skillet-Roasted Lemon Chicken. I omitted the fennel seed because, well, I’m not a fan. I have to say this recipe was rather easy minus the whole chicken and backbone situation. I’d probably have the butcher prep the chicken for me next time to make my life easier and prevent the unnecessary pressure of a whole chicken staring me in the face day after day. Nonetheless, I’m really glad we accomplished something the husband and I used to love to do together. Even with little children running around. I highly recommend this dish. But of course, I recommend almost every single thing Ina Garten makes. How could you not? I probably won’t cook again for, oh, 3 more months so let’s all celebrate the little victories, shall we? I hope everyone has a wonderful Thanksgiving. There are two women I’d walk over hot coals for if asked. Sure, my Mom and my daughter mean a lot to me, but I’m not talking about them. At least not in this post. I am talking about Dolly Parton and Ina Garten. Nothing sounds better to me than spending time with both of these women drinking cocktails, eating high-fat, high-calorie snacks, and talking about our favorite things. Seriously. Then we’d stay up late talking, wake up in the morning and have coffee, make some biscuits, and I’d listen intently as they gave me the best advice on running businesses and life (in general). It’s been (at least) 10 months since Mike and I have had a “Date Night In.” Who am I kidding? I only guessed 10 months because I CAN’T POSSIBLY REMEMBER THIS HAPPENING AT ALL SINCE HAVING MY FIRST CHILD FIVE YEARS AGO. Mike and I are approaching our 7th wedding anniversary on November 7th and this would be a perfect way to celebrate given the fact that we fell in love cooking our way through every single Barefoot Contessa (aka Ina Garten) cookbook. Ah, the memories. And oh…those pounds. Ina don’t play in the love and butter business. 1.Treat dinners together as a gift. Well that’s good to know because the way our dinners currently operate is whenever I’m finished with dishing up one person’s plate is when they get it and immediately find their way to their respective spots at the table and immediately begin eating. So, if we can possibly manage to be eating at the exact same time and eating the exact same thing, we are winning already. And if we are eating something where I didn’t have to cut another person’s portion up in teeny-tiny pieces or fill a sippy cup, then we are living it UP, people. 2.Don’t go crazy on fancy food. This is EXACTLY why I tend to focus my efforts on HomeRun Thin Crust Pizza straight from the freezer section at the grocery store. Thank you, Ina, for affirming my choice 3x each week. 3.Dress up your table — a little bit. Uh, sounds like this is the perfect reminder to vacuum the random crumbs out of the table grooves, sweep up the bits of food Mae threw on the floor 4 days ago, shove the random rescue bot, puzzle piece, and sippy cup with sour milk to another part of the table, and wipe down (you know, because this is a special occasion) the plastic place mats. In other words, we are getting fancy. Wait. We clean up after the date night in? Like, wash dishes? Scrape plates? What kind of a date is this, anyway??? 5.Save your binge-watching for after dinner. Ahem, for those of us experiencing life with a loved one alongside two children under the age of 5, I think we’d ditch the CD from Paris and instead sit in absolute SILENCE. Just listening to each of our jaws lightly chomping food sounds like absolute heaven if you ask me. No questions. No noise. No humans talking. Not even the ones on the date. Just straight up mastication in beautiful silence. So, obviously we have some work to do in order to achieve the Ina/Jeffery Date Night Nirvana. Heck, we can’t even find a way to escape for our anniversary and I think the closest getaway we have secured is HOOVER (this is a suburb 15 minutes away for those of you unfamiliar with Birmingham). In the meantime, I’ll just be over here dreaming about Ina cooking for me. And perhaps the four of us (Ina, Jeffrey, Mike, and myself) running all over East Hampton looking for dinner clues and finishing our evenings on the beach complete with bonfires while a CD is softly playing in the background as we reminisce on NEVER having been in Paris like, ever. Oh, and then Ina and I would scrape and stack the plates so Mike and Jeffrey didn’t have it so bad during clean up. Barefoot Contessa + Skinnytaste Marriage. On my plate. Even on Weight Watchers. Double Yes.